Fabio Capello is undoubtedly one of the most famous Italian coaches in the world. Charismatic and agonistically charged like very few professionals in this field. For many he is the prototype of sergente di ferro (Italian for iron sergeant) very capable of transmitting any team his winning mentality. Extremely solid – Capello has always been portrayed as such. Did Capello begin his soccer career as a coach? What maybe a lot of young soccer fanatics don’t know (stressing on the new generation) Fabio Capello started off as a rather talented soccer player. His first team Spal proclaimed his debut in soccer – the professional one – back in 1964 when he was just 18. He was a rocky midfielder with a squatty physique but of great visual play. Like any other soccer player of a certain caliber he did too look for a predominant team to conceal his talent, so three seasons later when A.S. Roma (back then) squad president Franco Evangelisti called for him, Capello could not refuse. 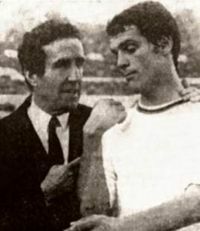 Alongside coach Oronzo Pugliese (Helenio Herrera will take his place later on) Evangelisti formed the path of a sure thing – the Fabio Capello center-midfielder able to help the team with his skills in creating the game. In a matter of years, in fact, Capello became the pillar of a medium level team which did not bring any results in the championship but won one Italian Cup in 1969. Maybe pure casualty, perhaps because he was really one of the symbols of the A.S. Roma of those late sixties Capello scored in the final. Roma unfortunately could not keep the young pupil for too long as the new management led by president Alvaro Marchini was not of wealthy foundations. The budget shaking Roma lost two other great players – Luciano Spinosi and Fausto Landini. Along with the inevitable and general disappointment of all the giallorossi fans, Capello left but found another great team to continue on where he had left off. He chose Juventus as his next club. Maybe it was the other way around but Capello only lived of success from that season on and with the arrival of Capello Juventus finally acquired the hard to find – so called – “man of center-midfield”, that athlete with the hard task of building an offensive play. Juve lacked of such an athlete the previous year. He was appreciated for his delicate, simple but reasoned ball touch – Picchi’s ideal game philosophy. Despite all the right signals it wasn’t a great year for Juve and Capello consequently did not immediately fit in the team’s geometry. Anastasi also faced a tough year as his shots barely hit the target, while to really put Juve in a tough spot was the dramatic death of Coach Armando Picchi who died consecutively to his illness. Bianconeri’s President Boniperti then chose primavera’s coach Czechoslovakian Vycpalek to take his place. The following year was a different story for both Juve and Capello who will later on be called “the professor”. Finally Juve seemed to have found the right formula and Capello became the mind and engine of a team able to win two consecutive scudetti (also thanks to champions like Anastasi, Bettega, Causio, Haller and goalies Carmignani and Zoff). His mentality on the field could not go unnoticed by Valcareggi who called him to appear in the National team. Capello played 32 matches with the azzurri and he became famous for scoring in Wembley against England in 1973 (first Italian win against the English). In the mean time in the Juventus bench it was time for another coach, it was Carletto Parola’s time to shine and within another year Juve stiched yet another scudetto in the black and white jerseys – Capello’s third. The year after Juve had to bow down to Radice’s Torino, in the season which will be last for Capello. As Trapattoni had been given by Boniperti the next coaching duties for Juventus, a new trading deal was behind the corner. The change was between Juventus and Milan this time around and Fabio Capello and Romeo Benetti were the athletes involved in the exchange, as both players were not the youngest in the field anymore both teams felt they had reinforced their squad. After 6 seasons in a Juventus jersey with 165 games played and 27 goals it was then time to become a rossonero. Led by a Gianni Rivera eager to show his experience and his technique, Fabio – as usual – had a hard time fitting in the team. An A.C. Milan still under construction Capello felt the challenge of a new position on his shoulders but still carried it through with intelligence and modesty. His first result in Milan arrived in the Italian Cup of 1977 and two years later he placed on his hearth Milan’s 10th scudetto – the star. That was Capello’s 4th championship but in the mean time he lost his first spot in a team where a young Franco Baresi was soon to become a reality for Milan’s midfield. The following year Milan was dragged down to Serie B due to a scandal regarding bets – prompt signal for Capello to say goodbye to his soccer career.